The third edition of SMART Data Sprint will count on the participation of Richard Rogers (University of Amsterdam), the director of Digital Methods Initiative and the author of Digital Methods (MIT Press, 2013). From 28 January to 1 February 2019, international participants will come to NOVA FCSH to attend keynote lectures, short talks, parallel sessions of practical labs and to join research projects. Experts and scholars will invite participants to join projects and work in a collective problem related to the following fields: Journalism Apps, Health myths’ circulation on social media, Interrogating Vision APIs and Frugal Innovation (other projects be confirmed). This year SMART Data Sprint is committed to critically approach engagement: a key parameter for web platforms studies, and a driver for scientific analysis and critique. 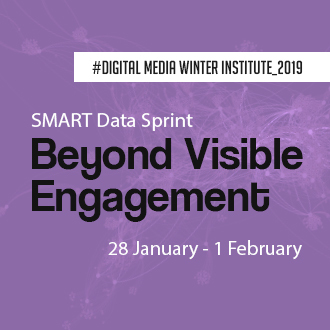 SMART Data Sprint 2019 invites participants to go beyond visible engagement: foregrounding digital practices and considering alternative metrics to measure other forms of engagement (than the use of the most relevant or trending lists as sources of knowledge). It is also an invitation to account engagement under unseen practices and the logic of both human and non-human activities. Deadline for applications: 13 January 2019.